The Power Player Breakfast Series brings women at the top of their career game to NYWIFT for intimate, inspiring discussions on their current projects, working their ways to the top and other exciting industry insights! 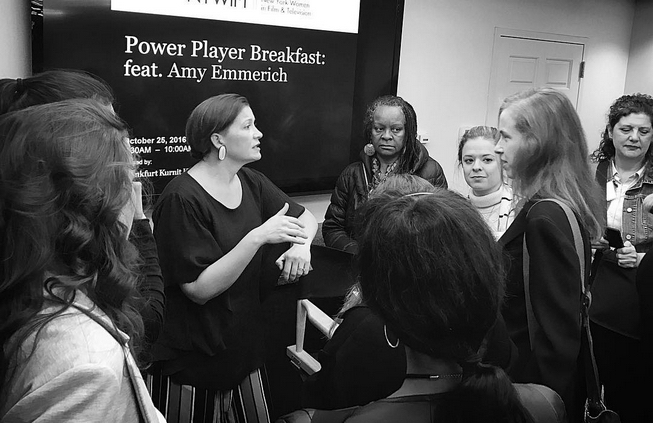 Last month, the Power Player Breakfast welcomed guest Amy Emmerich, Chief Content Officer at Refinery29, a leading digital lifestyle media company for women. 1) As Chief Content Officer, Amy is queen of the Refinery29 video department. As a young girl from College Point, Queens, with no connections, she has worked everywhere from The Rosie O’Donnell Show, MTV, and Vice – to name a few. 2) She would rather hire someone with an awesome attitude than a rotten person with years of expertise. Everyone always says it’s who you know, but if you don’t know anyone and you’re trying to get a job, be amazing to be around. Be a passionate sponge, who is great at collaborating and makes people feel good. 3) The lines between digital and traditional television are blurred. Amy describes digital content as a farm for television. Create awesome digital stuff, build a fanbase, serve a niche audience and you just might unlock the next level of your career. Watch High Maintenance, East Siders and Whatever, Linda for reference! All started as small indie web series that grew into something bigger. 4) Be persistent (not annoying) when going after what you want. When Amy first tried to get an internship on The Rosie O’Donnell Show, she kept getting turned down because she was young and had limited availability but she respectfully kept at it until someone took a chance and believed in her. This allowed her to build the relationships which furthered her career. 5) Always shout out the people you that have taught you things/you love working with because that’s what cool, community-building, power player, boss babes do. I can’t even count the number of times Amy gave props to the people who made her career possible along the way just at this one event. We all know it takes a village to make it in this business, so don’t go around pretending you did it all on your own! Thanks for all your wisdom, Amy! The Power Player Breakfast series is one of NYWIFT’s signature events, some of more than 50 professional development programs produced every year. See what’s coming up next on the NYWFIT events calendar. I eat all the vegan things. I pet all the animals. I consume all the scifi. I make/act in the films. Follow on the social to connect!